Carry daily medications. 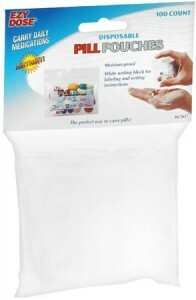 Zipper sealed pill pouches are dust-proof, spill-proof, moisture-resistant and reusable. See-through pouches not only protect their contents but they allow for easy identification. Convenient for pills and a wide variety of other uses. White writing area makes for easy labeling right on the pouch.